New rifles and carbines have been adapted for the civilian market and are part of a drive by the company to carve out a niche in the market for hunting and sporting weapons. Andrei Kirisenko, advisor to the General Director of the Kalashnikov Concern, has announced the production of three new models of the firearm during the Eurostatory Land and Air-Land Defense and Security Exhibition, now under way in Paris. The models in question are the Saiga-MK107, Saiga-9 and Saiga-12 model 340 weapons, the first series of which will enter production next year. Although the producer has constructed them based on military firearms, these carbines and rifles are destined for the civilian market. For example, the sportive Saiga-MK107 carbine was modeled after the Kalashnikov assault rifle from the 100 series. Like its "military colleague", the Kalashnikov Concern's sole carbine currently made for the civilian market is designed with balanced automation. This innovative engineering has allowed for a reduction in firepower, while the accuracy of the weaponry has nearly doubled. According to Kirisenko, the concern has already produced several sophisticated Saiga-MK107 models, which for now will continue to use U.S.-produced Remington 233 ammunition. The company is planning to create a carbine that would meet NATO's standards (7.62 x 51 caliber), as well as those of Russian ammunition, whose caliber is 7.62 x 39 and 5.45 x 39 millimeters. The Saiga-9 carbine has a "military" past, since it is based on the Russian Vityaz-SN submachine gun. The highlight of the carbine, which is used with Parabellum 9 x 19 ammunition, according to its makers, is not only its reliability, but also its high level of affinity with the submachine gun on which it is based. They expect the external appearance of the firearm to attract clients from all over the world. The manufacturer is also confident in the success of the Saiga-12 model 340, a practical weapon that is the third example of the new "civilian" firearm. It has been created according to requests received from sportsmen and SWAT representatives. The Saiga-12 model 340 has a stronger receiver and a quicker recharge system. A muzzle break has substantially lowered the firepower so that the weapon will not "indulge" after the shot. According to the Concern's representative, this firearm can be used by sportsmen, as well as by police units aiming to provide civil security. It is important to note that Eurostatory 2014 did not mark the debut of these new types of firearms produced under the famous brand. They had already been exhibited at the Shot Show 2014 in the U.S., where the Kalashnikov Concern and the Russian Weapon Company (RWC) signed an exclusive supply agreement with the U.S. and Canada. The volume of export to these countries will be between 80,000-200,000 units per year. "RWC, an exclusive dealer, will help Kalashnikov conduct a consistent policy in the field of selling sporting and hunting weapons in North America," said the Kalashnikov Concern's Deputy General Director of Sales and Marketing, Pavel Kolegov. "This collaboration will increase the Concern's participation in the world's largest civilian firearm market." The deal is a clear signal to other players in the market that Kalashnikov has serious intentions of establishing a new niche, which, according to independent military expert Igor Korotchenko, is very important for the company. "This indicates that Kalashnikov is returning to the classic business model - that is, earning money, active marketing, and an assertive export policy. This is required not only for the rebirth of the brand, but also for re-establishing positions in markets where we were squeezed out by producers of cheaper clones," said Korotchenko. Although it is concentrating on civilian firearms, Kalashnikov has not neglected its traditional niche - the military. 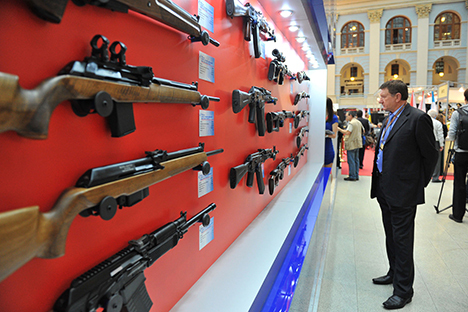 Russia's firearm exports are now dominated by single yet substantial contracts, which, according to the director of the Federal Service for Military-Technological Collaboration Alexander Fomin, help the FSMTC attract countries that are not regular purchasers of Russian weaponry and thus enter new markets, offering not only automatic rifles and ammunition, but new kinds of weapons. That is why the firm is presenting its most famous military models at Eurostatory 2014: Kalashnikov automatic rifles of all calibers, its GP-34 grenade launchers, SVD and SVDS Dragunov sniper rifles, SV-98 and SV-99 sniper rifles, the Vityaz SN submachine gun, the 18.5 KSK military shotgun, the Krasnopol guided artillery weaponry and the Kitolov-2M. According to FSMTC data, firearm exports totaled 1-2 percent of Russia's overall exports in 2013.